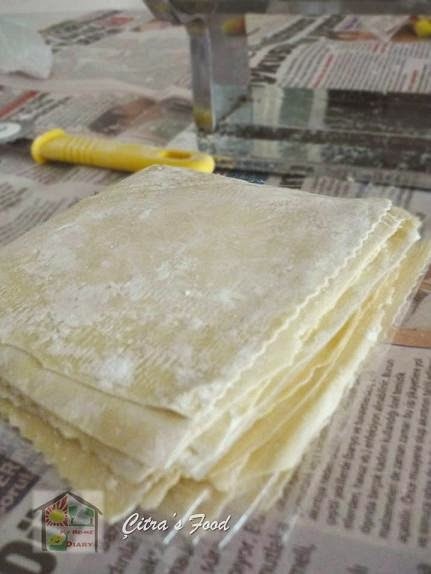 Homemade Wonton wrapper / membuat kulit pangsit. about 130 gr hot boiling water. "Children Learn more from What you are than What you teach"
With small kids around the house we must always ready with any healthy and yummy meals so anytime we can provide them within a minute. For that I always make stock some whether homemade chicken nugget, croquette or this cheesy chicken balls. Whenever I need it, I just take out from my freezer, let it defrost and warm it up. 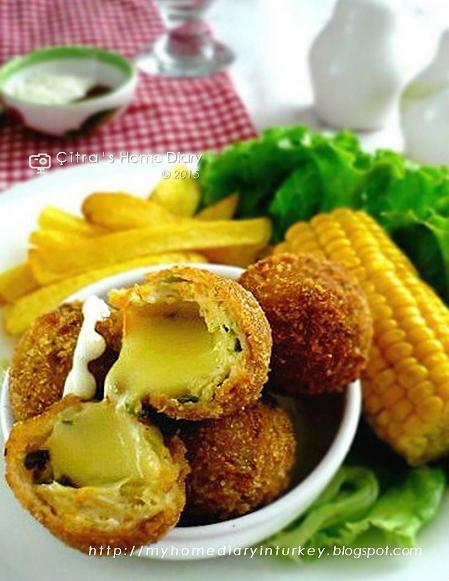 This cheesy chicken ball is one of my favorite too.. serve it warm and we'll get best cheesy chicken ball ever. I usually store them in freezer after fry them, just thaw some on room temperature before warm it up on microwave or low temperature oven. HIKAYAH : Kisah Petani dan Keledainya. Dulu sebelum tidur, Bapak Almarhum selalu mendongeng untuk saya dan saudara2 saya. Banyak sekali kisah mulai dari kisah nabi nabi sampai hikayat Abu nawas yg melekat di pikiran saya hingga saya setua ini. Saya pikir ada baiknya cerita-cerita yang beliau kisahkan pada kami saat itu, saya tuangkan dalam tulisan di blog saya yang sederhana ini dengan harapan anak-anak saya kelak (dan juga pembaca yang lain) juga bisa mengenal hikayat-hikayat itu juga. Di sebuah desa hiduplah seorang bapak petani tua dan anak laki-lakinya. Kehidupan mereka sangat miskin hingga tak memiliki apa-apa lagi selain keledai tua. Akhirnya si petani memutuskan untuk menjual Keledai mereka ini. 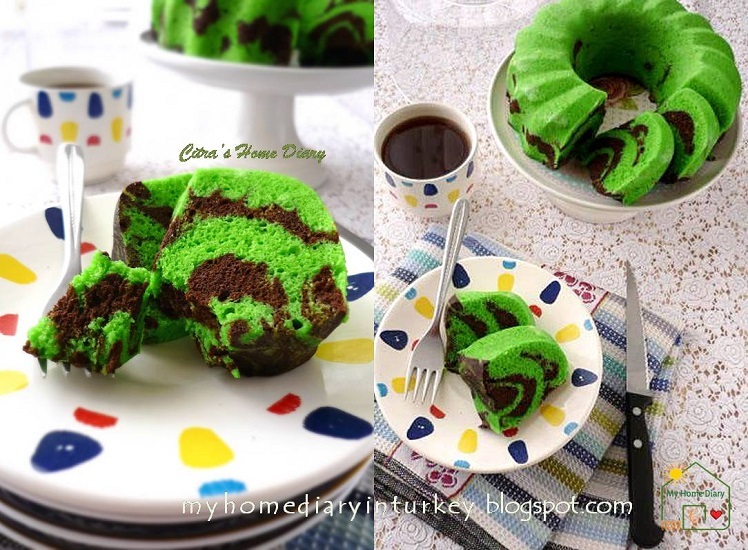 Steamed Pandan Chocolate Marble Cake (from Egg white) / Bolu kukus Pandan dari Putih telur. "Children need our presence more than our presents"
Selam everybody .... Merhaba from Turkey..
My today's post is steamed cake from egg white again. If you are my regular blog's reader you probably notice that I posted many steamed cake in this humble page, and some of them used egg white-mostly left over egg white.. Yes I do like steamed cake. Cake with steamed process I think it's more moist than bake one. 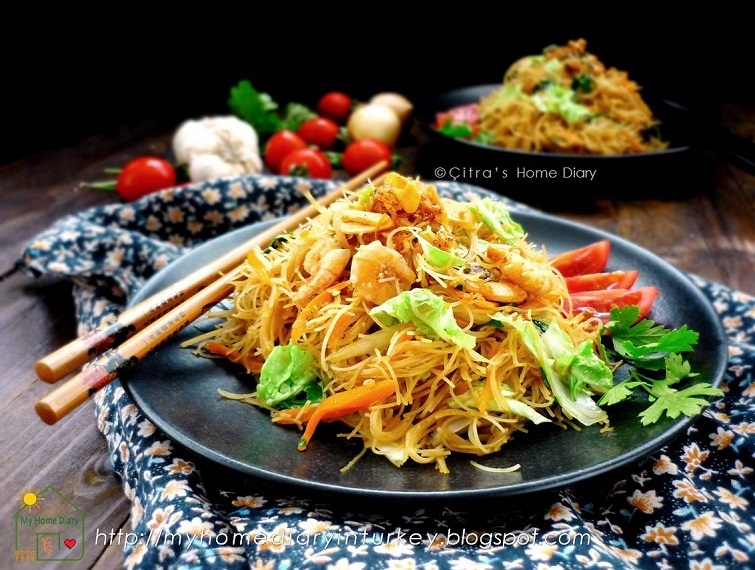 And for me any recipe I use with steamed process it become fail proof recipe (^,^) ... trust me. I tried many time, with same recipe, when I steamed it, it always came out fluffy and moist cake, while - some time I got 'broken heart' cake out from my oven... in fact that recipe with oven bake method... I have no idea why.. Please do check other steamed cake post on "steamed" over cooking method section. You can also check specific steamed cake from egg white like Spiced steamed cake here, Chocolate steamed cake from egg white, Steamed zebra cake here. 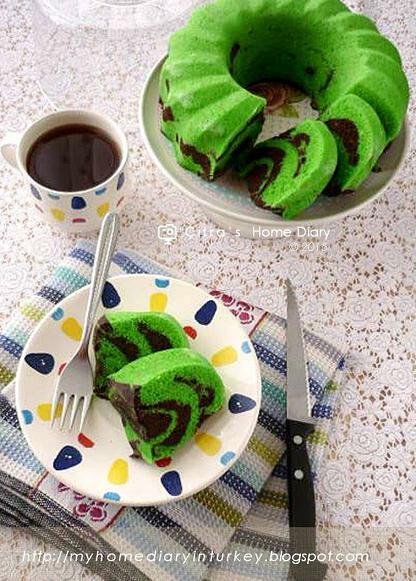 And today I just steamed another cake from left over egg white and this time I twist chocolate flavor with my favorite Pandan flavor on marble cake. Steamed process took about 45 minutes, also you must check by inserted skewer in the middle, continue steam if your skewer comes out still wet (it should comes out really clean). 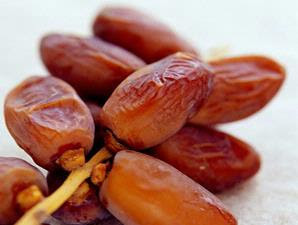 Suatu ketika, Rasulullah saw dan para sahabat ra sedang ifthar (buka puasa). Setiap kali mereka makan sebuah kurma, biji- biji sisanya mereka sisihkan di tempatnya masing-masing. Beberapa saat kemudian, Ali menyadari bahwa dia memakan terlalu banyak kurma. Biji- biji kurma sisa mereka menumpuk lebih banyak di sisi Ali dibandingkan di sisi Rasulullah. Maka Ali pun secara diam- diam memindahkan biji-biji kurma tersebut ke sisi Rasulullah. Should I or not frustrated surrounded by two people who hate vegetables? Should I or not frustrated surrounded by two people who picky at food? As a mom I already headache making healthy menu for my kid....then adding by one big man who picky on food and vegetables hates, my husband! Happy weekend to all of you..
What do you usually do with family to spend weekend together? It's summer time, maybe mostly you're on happy holiday this moment...Happy holiday for you! So...week end is really our family time, spending time together. 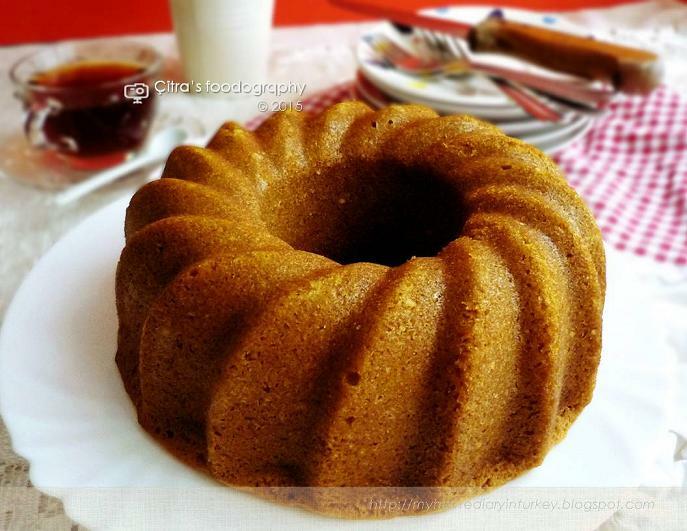 As every other week end in our house, week end is almost "cake" time ... so this week end I just make simple sponge cake with mocca flavor to accompany our tea and coffee time. This is my kid's favorite snack.. I sometimes serve this between lunch and supper time. I like it also. It's slightly savory, slightly sweet and make me feel really full without being guilty (^,^) ... with reduce a little butter and cheese for me, this snack absolutely healthy. Summer time like now days, we can meet many vendors on street selling this kind of satiated snack. But here in Turkey, the taste bit different from sweet corn cup sells in Indonesia. Sweet corn cup here simply mix the corn kernels with A LITTLE part of butter, for optional topping they let us choose ketchup, acılı sos (spicy sauce), and pomegranate vinegar. No other variation like when you visit Indonesian sweet corn vendors. 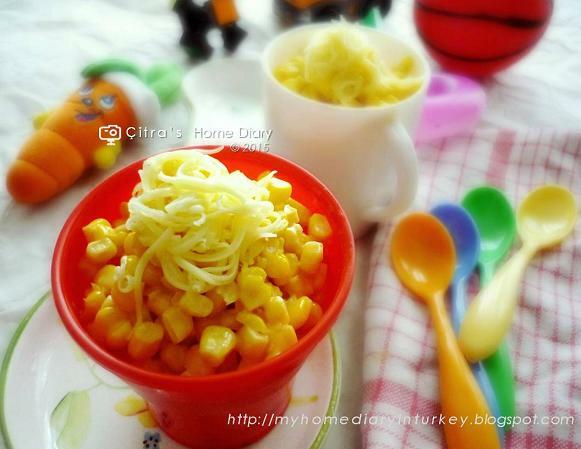 What I made today is sweet corn cup base on my taste with cheese topping. Of course feel free to choose your own taste and topping, it's basically boiled kernel mix with butter. For further taste and variation are depends on your liking. 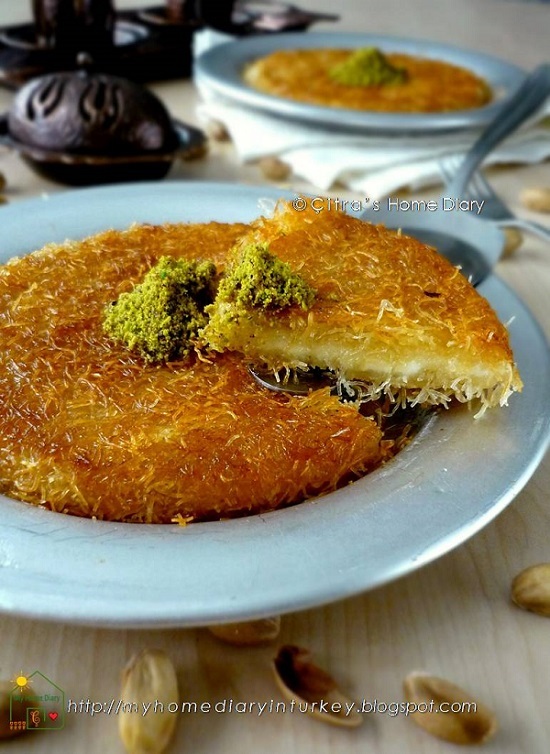 Künefe or kanafeh or kunafeh or kunafah or ... I don't know any other names of it.. But basically it's sweet pastry made from wiry kadaif filled/ layered with unsalty soft cheese and soaked in sugar syrup. Served hot or room temperature. 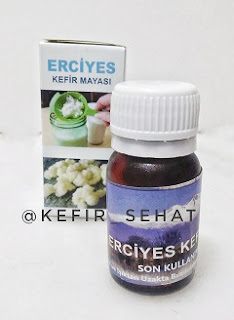 Künefe is popular from Turkey and from some Mediterranean countries (as a former Ottoman Empire). 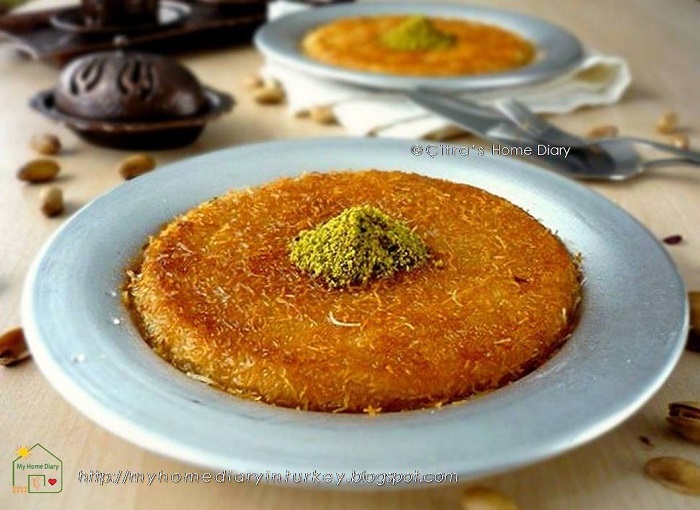 In Turkey, some cities (like Hatay, Adana, Mersin, Sanliurfa, Mardin) had claimed where this Künefe originated from. But according sources Künefe originally from Arabian.The soldiers of the Ottoman Empire which was sent on the road to the establishment of the Republic has gone to Yemen. Some of troops here had made some "sweets/ dessert" and then later when they (ottoman soldiers) have returned to their home they started to learn making this dessert. 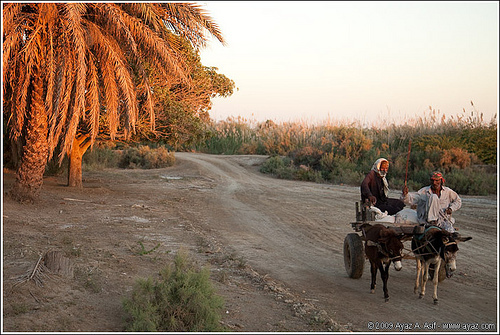 Künefe came to Mersin the end of the year 1930, and to Hatay at 1940s. I ate this sweet pastry first time few years ago when I got to Turkey for 1st time ( I think it was around 2008). And my first impression was this dessert was away too sweet for me.. any Turkish dessert were too much sweet for me as they mostly soaked in thick sugar syrup. But after few years living here slowly my taste have adapted, but still I eat some sweets in moderation. Since I live in Turkey, making bread is part of my daily work cause we eat bread in any ways almost everyday. Almost everyday or at least once in 2 days I always serve my family with fresh bread. 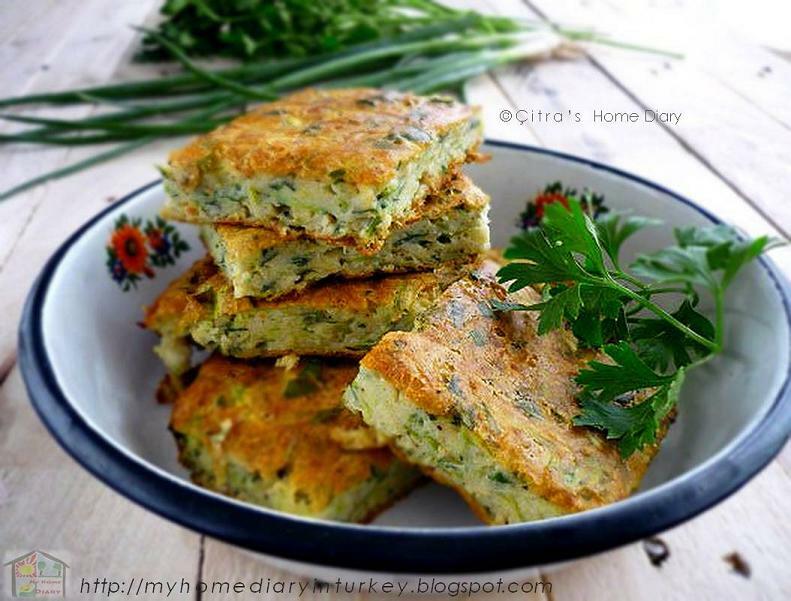 Nothing can replace warm and fresh bread from oven serve at your family table... as warm as the togetherness it self..
As Turkish people mostly consume chewy (and slightly hard) bread so mostly I made that type of bread. Different type from Asian bread (which mostly I ate few years back) which has soft and spongy texture also mostly slightly more has sweet and milky taste. So of course my daily bread I made are more chewy and slightly hard in texture even once in a while we eat soft and spongy bread but I reduce as much as I can the amount of sugar in it. You can check my soft bread (No egg required) here. 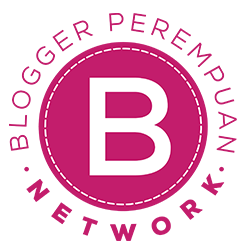 Don't forget to check my other bread post on "Bread" category. 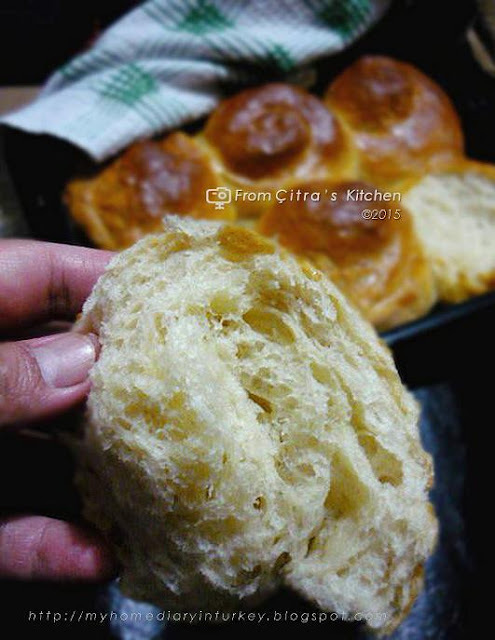 And my today's post also about bread and I want to try Korean style bread roll-ppang 롤빵.